When it was time to shave boxwood bushings whisker-close on an 1880s pegbox, advice was sought. Spending other people’s money has never been a problem for my circle of advisors. All manner of chisel manufacturers were recommended. I settled for a couple of used Buck Bros. chisels brought back to lovely health by a pro. Months later, I learn craftsperson Jayne Henderson had visited a Maine manufacturer recommended by my acquaintances. Even better, a hand tool demonstration at Independence Seaport Museum, Penn’s Landing, will feature these Lie-Nielsen tools. Perfect timing, as we want additional guidance on wood planes and sharpening techniques. Lie-Nielsen sent their crack team of cabinet makers / salesmen to Philadelphia. Examples, answers, explanations, it flowed with an easy pace. Two items of immediate interest: use of a scraper, and sharpening a hand plane blade. A scraper is a thin flat piece of steel with a sharply squared edge. One can scrape the thinnest shavings of wood with such a tool. The answer to my use question moved to sharpening the scraper, truing its edge. A crowd quickly gathered as the representative covered the simple technique of producing the correct scraper edge. Guess it was not only me wanting help! In covering planes I might purchase for general use repairing instruments, it also came back to care of the blade. 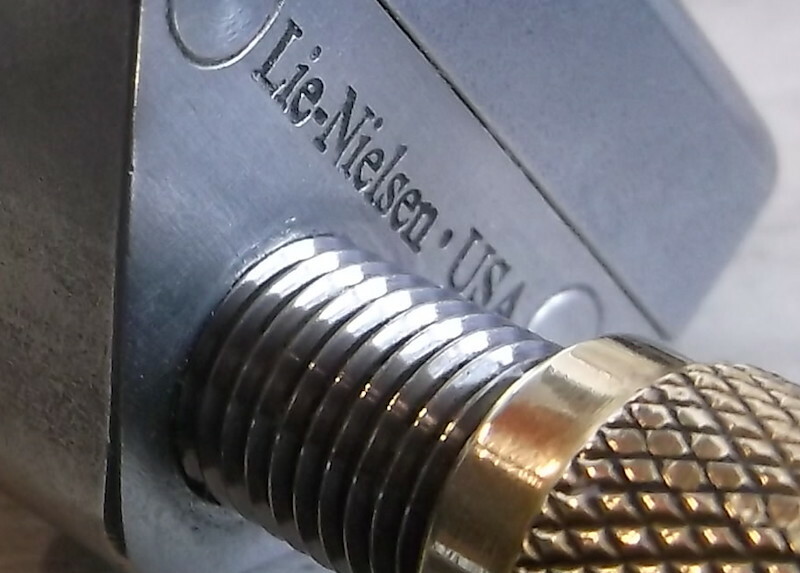 The Lie-Nielsen honing guide is the nicest piece of sharpening equipment in the business. After the demonstration plane had its blade sharpened, staff was removing hair-thin wisps of ribbon from a block of maple. The wood was left mirror-smooth. Amazing! Their chisels? $55 buys you the nicest wood chisel in the world. The feel is heavenly, the machining impeccable, and the quality of the metal, unbeatable. Luxury items or wood shop essentials? Maybe both, but it’s a tool you’ll have the rest of your life. I bought the scrapers. Next big job, a Lie-Nielsen hand plane, a chisel, and sharpening tools are joining the bench! This entry was posted in Craftsman / Artist, Product Review and tagged lie-nielsen.